The embroidery technique is the premier method of portraying your graphic identity on fabric. The 3-dimensional high impact effect is extremely durable and long lasting. 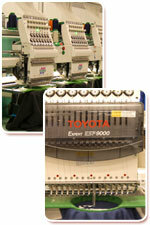 Image Solutions has made major commitments to the embroidery technique with extensive multiple head equipment that provides superior quality control. And we are proud to state that we do all embroidery in-house to provide extremely fast turn around of our customer orders. In addition, our in-house graphic digitizing and related electronic techniques provide extremely accurate representation of each customers graphic identity. When needed, our in-house art and design capabilities can create any graphic image you require. Request an on-site visit from one of the Image Professionals from Image Solutions …Now.